This is crazy! How many gifts do people need at Xmas? All it takes is just one thoughtful gift for close family members. The problem is that people forgot how make things and have the attitude towards consumerism. #Handmade gifts focus on quality vs quantity. We should teach kinds #crafts more and promote the value of hand-crafted gifts over mass-produced discounted goods. 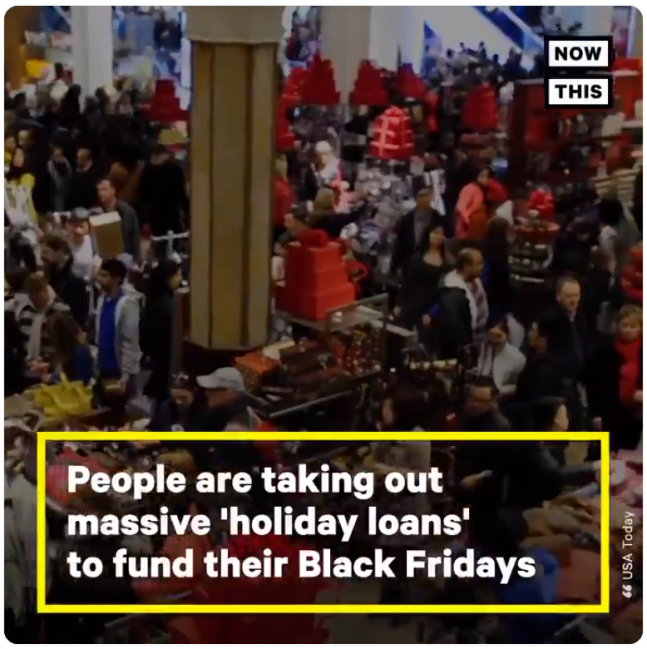 #BlackFriday has gotten so out of hand people are taking out loans to shop. Black Friday was out of hand when people starting shooting other people to get at the goods first. Consumerism - you know, I was just telling someone earlier this month how I grew up poor. When we got things, we used them until they broke. We didn't discard them because the next, more up-to-date model came out. I admit, I am also guilty of that - discarding things before their useful lives are truly done. But I do try to be more conscious of that before I buy. I ask: Will I use this? How long will I use it for? I'm not always successful at curbing my shopping urges, but being conscious of them is a start!